Durable, vinyl pad holder cover protects an 80-page steno notebook made with 30 percent post-consumer material. Slash pocket on inside front cover holds loose papers. Slit on back cover securely holds steno notebook in place. Pad holder features foam padding. Coverboard is made from 100 percent post-consumer material. 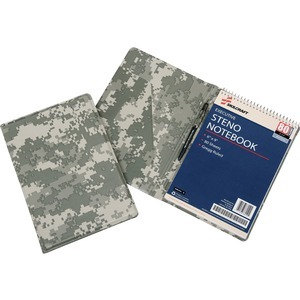 Digital ACU camouflage color pad holder accommodates and includes one 6" x 9" steno book and a retractable, ballpoint pen.